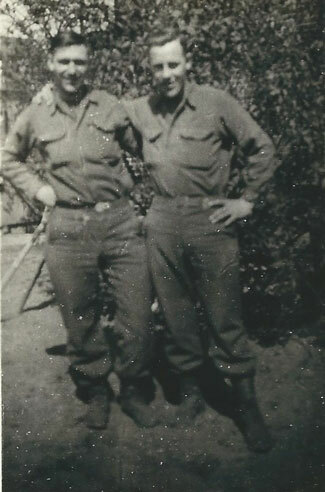 Harry A. Krantz was drafted and inducted into the Army as a Private (Pvt.) in his hometown of Chicago, Illinois on June 28, 1943 and entered active service two weeks later on July 12, 1943 at Camp Grant near Rockford, Illinois. Born May 30, 1920, he was 23 years old and single, the oldest son of Anton and Mary Krantz. At the time of his induction he worked as a baker at John R. Thompson and Son Bakery in downtown Chicago. The location of his basic training is unknown. He departed for the European Theater of Operations (ETO) on January 2 and arrived January 11, 1944. The ship name and port locations are unknown. His first known assignment in the ETO was as a cook (MOS 017) with Headquarters (HQ) Company, Supreme Headquarters Allied Expeditionary Force (SHAEF). The earliest known documentation of his assignment to HQ SHAEF is a Morning Report dated February 3, 1944. It is unknown whether or not he was temporarily assigned to any other units during the eighteen days from the time he entered the ETO on January 11 until being assigned to HQ Company, SHAEF sometime prior to February 3, 1944. At this time SHAEF was located at Camp Griffiss, Bushy Park, Teddington London, England. Sometime between February 1944 and August 3, 1944 he was promoted to Private First Class (Pfc). SHAEF moved from London, England to Versailles, France in August 1944. Pfc. Krantz continued to serve as a cook with HQ Company, HQ Command until October 11, 1944 when he was transferred from Camp de Satory, Versailles, France to the 11th Replacement Depot in Chester, England for reassignment. He arrived at the 11th Replacement Depot in Chester on October 16, 1944. He spent only three days there before again being transferred on October 19, 1944 to the 12th Replacement Depot at Tidworth Barracks, Wiltz in south-east Wiltshire, England arriving on October 21, 1944 and remaining there a month. During this time he received training as a Medical Aid Man (MOS 657). After receiving his medical training he continued his journey through several replacement depots in France. On November 22, 1944, he was transferred from Tidworth Barracks in England to the 19th Replacement Depot in Etampes, France about 30 miles south, south-west from the center of Paris, where he arrived on November 29, 1944. On December 5, 1944 he was transferred to 17th Replacement Depot at Neufchateau in the Lorraine area of north-eastern France, where he arrived the next day, December 6, 1944. Just three days later, on December 9, 1944, he was transferred again to the 38th Replacement Battalion at Morhange, France where he arrived on December 11, 1944. Two days later he received his final assignment to the 35th Infantry Division. Pfc. 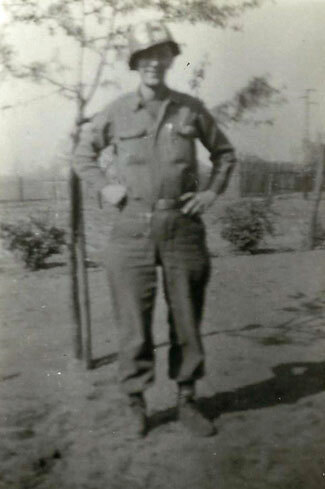 Harry A. Krantz joined the Medical Detachment, 134th Infantry Regiment, 35th Infantry Division on Wednesday, December 13, 1944 while the unit was at Sarreinsming, France just south and slightly east of Saarbrucken, Germany. He was assigned as an Aid Man (Combat Medic) to Company C, 134th Infantry Regiment. 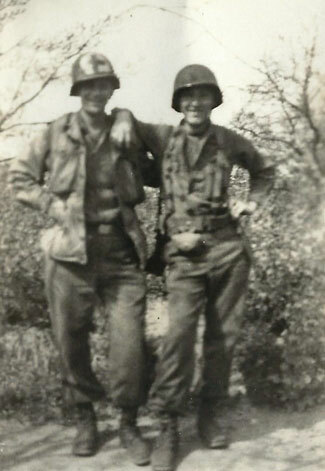 Although officially part of the Medical Detachment, Aid Men during WWII travelled with and were essentially a part of the infantry unit to which they were assigned. During WWII each rifle company, such as Company C, was divided into 3 platoons and each platoon was assigned a medical Aid Man. Their mission was to provide medical assistance and stabilize the wounded until they could be transported to the Battalion Aid Station. As medical personnel they were not permitted to carry weapons. Pfc. 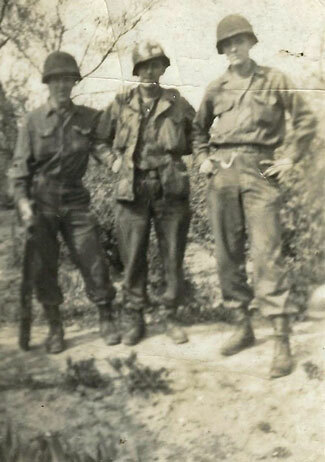 Krantz was assigned as Aid Man (Medic) with the 2nd Platoon of Company C, 134th Infantry Regiment. Just days before his arrival, the 35th Infantry Division had fought its way into Germany inflicting and sustaining heavy casualties. The day prior to his arrival, Company C along with other 35th Division units, crossed the Blies River and entered the town of Habkirchen, Germany. During the early morning hours on the day of his arrival, December 13, 1944, the 35th Division launched a large scale offensive and after six days of fierce fighting a bridgehead into Germany was established and secured. On December 19, 1944, after fighting for 162 consecutive days, the 35th Infantry Division was ordered to hold and consolidate. Pfc. 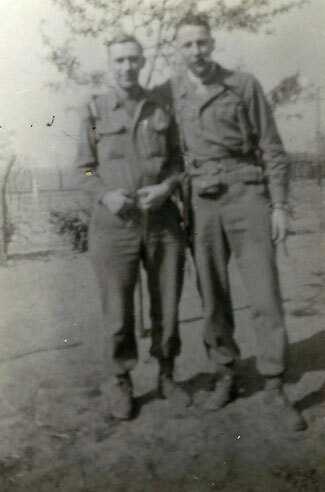 Krantz was awarded a Combat Medical Badge effective December 20, 1944. The 35th Division moved to Metz, France on December 23, 1944 where they spent Christmas before being sent to the Ardennes to fight in the Battle of the Bulge. On Christmas night the order to move was received and within 24 hours of leaving Metz they were in the thick of battle near Bastogne, Belgium. According to the 134th Infantry Regiment Unit History, their participation in the Battle of the Bulge cost the Regiment 1,449 battle casualties including 140 killed, 1,011 wounded, and 298 missing. The Regiment was awarded a Presidential Unit Citation for heroic action in the Ardennes for the period from December 28, 1944 to January 16, 1945. When the rest of the 35th Infantry Division left the Bastogne area and moved back to Metz, France on January 18 - 19, 1944, the 134th Infantry Regiment remained in the Ardennes and continued fighting there as Combat Team 134 (CT-134) attached to the 6th Armored Division. Pfc. Krantz was wounded in action on Tuesday, January 23, 1945 near Troine, Luxembourg. He was treated at the 1st Battalion Aid Station at Hachiville for a left chest contusion, but remained on duty. We has awarded a Purple Heart for this injury. Two days later, on January 25, 1945, Company C launched an attack from a wooded area over a snow filled open field, toward the German held town of Weiswampach, Luxembourg. The town was situated approximately a mile or two to the east and was at a slightly elevated position. The enemy opened fire with mortars, small arms, and machine guns as the men of Company C started across the field pinning them down, killing twelve and wounding twenty one. Pfc. 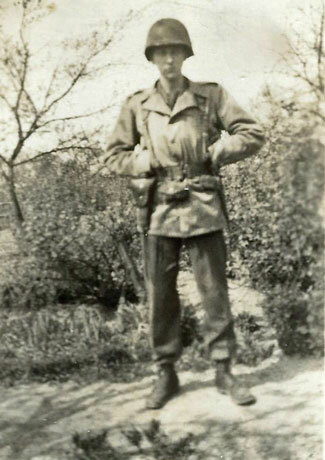 Harry A. Krantz was awarded a Bronze Star Medal for heroic action during this battle. According to the award citation "Because of the type of enemy fire utilized, it was difficult for medical aid personnel to move about, but Private Krantz, an aid man, with complete disregard for personal safety, moved among the personnel of Company C, administering first aid and, in many instances, carrying wounded to the safety of woods in the rear." On January 31, 1945 the 134th Infantry Regiment was detached from the 6th Armored Division and began the move north to rejoin the rest of the 35th Division in the vicinity of Gravenvoeren, Belgium about 10 miles south of Maastricht, Holland. By early February 1945 Company C moved to the vicinity of Bocket, Germany, about 40 miles south west of Dusseldorf. Plans were made for the 35th Division to cross the Roer River on February 10, 1945, but the retreating enemy opened 2 large dams flooding the Roer River Valley and the surrounding countryside thus delaying the river crossing. The night of February 25, 1945 the 1st Battalion, 134th Infantry Regiment, of which Company C was a part, stormed the town of Hilfarth, Germany situated on the west bank of the Roer River and cleared the town of the enemy the next morning. By the end of February the Roer River was crossed near Huckelhoven, Germany and the 35th Division swung north along the eastern bank, rapidly advancing to the west bank of the Rhine River. Early March found the Regiment in the vicinity of Venlo, Holland and on March 26, 1945, the 134th Infantry Regiment crossed the Rhine River near Rheinberg, Germany about 25 miles north west of Essen. They had entered the industrial Rhur region. During April 1945 the 134th Infantry Regiment continued its advance eastward across Germany toward the Elbe River. The end of the month saw the Regiment on occupation duty in the vicinity of Hannover where they were when the war in Europe ended on V-E Day. Another move in mid-May brought them to the Koblenz area of Germany, at the confluence of the Rhine and Moselle Rivers, where they continued occupation duty. Pfc. 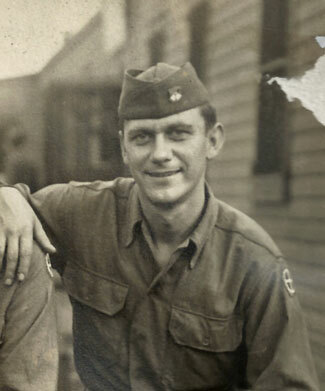 Harry A. Krantz began his journey home in mid-July 1945, being redeployed with the rest of the Regiment to the tent city of Camp Norfolk, about 40 miles southeast of Reims, France. Departing the Port of LeHavre in mid-August for England, they spent a short time at Tidworth Barracks before sailing for the U.S. from Southhampton, England on September 5, 1945 aboard the Queen Mary. The Queen Mary dropped anchor in New York Harbor five days later on Monday, September 10, 1945. From there the troops traveled by rail to Camp Kilmer NJ. The following day Pfc. Harry A. Krantz was assigned "for purpose of recuperation" to Camp Grant, Illinois, the same post where he had entered active service. He was relieved of assignment and discharged from the Army on November 6, 1945. A lifelong Chicagoan, after the war he continued to work as a baker until his retirement. Harry A. Krantz passed away December 13, 1985. He is buried at Windridge Memorial Park and Nature Sanctuary in Cary, IL. 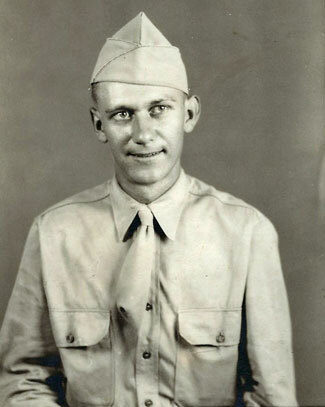 Private First Class Harry A. Krantz, 36674236, Medical Department, United States Army, for heroic service in connection with military operations against an enemy of the United States at ****, Belgium on 25 January 1945. When Company C, 134th Infantry, launched an attack over an open field, the enemy employed grazing fire, pinning down Company C and forcing it into a fire fight. Because of the type of enemy fire utilized, it was difficult for medical aid personnel to move about, but Private Krantz, an aid man, with complete disregard for personal safety, moved among the personnel of Company C, administering first aid and, in many instances, carrying wounded to the safety of woods in the rear. Private Krantz' bravery, coolness, devotion to duty and disregard for personal safety, denote him an asset to his unit and a credit to the Medical Department of the Army. Entered military service from Illinois.